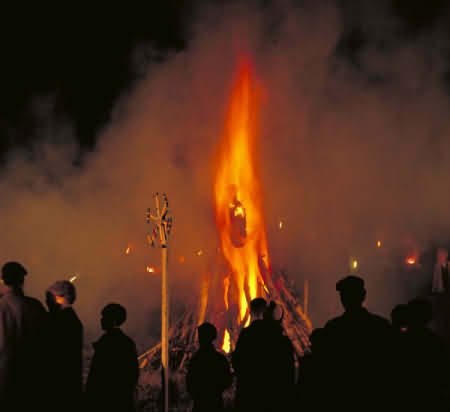 The most famous annual celebration in England - for 400 years and still, bonfires have burned on November 5th throughout England to mark the failed Gunpowder Plot. On the night of November 5th soon after the sun sets, throughout the length and breadth of England, we commemorate the capture of Guy Fawkes with bonfires and fireworks - bonfires are set ablaze and an effigy of Guy Fawkes is burnt with fireworks lighting up the skies! Interesting fact - the word 'bonfire' originates from 'bone fire'. Resistance to persecution against practising Catholics in England in the 16th and 17th Century, erupted in an outburst of Catholic extremism which came in the form of the Gunpowder Plot of 5th November 1605. A radical group of young men, tired of the persecution against their faith, conspired to blow up the new King James 1st along with his Government in the Parliament building, and in the aftermath cause an insurrection in the Midlands of England including the Cotswolds and use foreign assistance to restore a Catholic monarch to the throne in the person of the King's daughter, third in the line of succession, Princess Elizabeth. At the time, King James 1st was on the throne. England had broken away from the Catholic faith and the Church of Rome in Henry VIII's reign (circa 1536), but there were still many Catholics in the country. 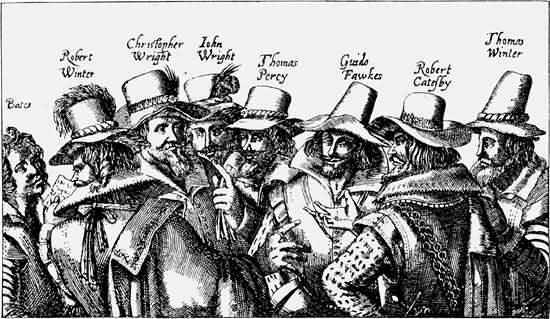 Guy Fawkes (an Englishman) joined up with a group of thirteen Catholic plotters, led by Robert Catesby, who planned to overthrow the King and put a Catholic monarch back on the throne. The Chastleton estate in the Cotswolds was once owned by Robert Catesby. Catesby mortgaged the property to Walter Jones, and when Catesby fell on hard times and was unable to keep up payments, Jones took over the property. Jones pulled down Catesby's house and built a new, grand mansion, which is the Chastleton House we see today. Guy Fawkes had previously fought for Catholic Spain against the Dutch and had become experienced in the use of explosives. He also used the Italian version of his name - Guido Fawkes. The plotters rented space in the cellars of the House of Lords and filled it with 36 barrels of gunpowder. Guy Fawkes was put in charge. They planned to explode the gunpowder during the opening of Parliament, on 5th November 1605. One or more of the plotters, however, were worried that some of their fellow Catholics and friends would be at the opening and get caught in the explosion, and were given written warnings not to attend that day. It is known that a certain Lord Monteagle received an anonymous letter warning him to go to the country because Paliament would "receive a terrible blow". Lord Monteagle showed the letter to the King, and the cellars were thoroughly searched and Guy Fawkes caught. After several days of torture on the rack, Guy Fawkes gave up the names of his fellow plotters and eight of them went to trial in January 1606. All were found guilty and executed by hanging and quartering in the terrible fashion of the times. Robert Catesby died at the raid on Holbeache House on November 8th, 1605; he and Thomas Percy both being shot apparently with a single bullet. On 5th November 1605 Londoners were encouraged to celebrate the King's escape from assassination by lighting bonfires, provided that "this testemonye of joy be carefull done without any danger or disorder" - and indeed an Act of Parliament soon followed, declaring 5th November as a day of thanksgiving throughout the country for "the joyful day of deliverance". It was at Coughton Court, on the edge of the Cotswolds, that arms, horses and ammunition had been stored, ready for the uprising that was meant to follow the destruction of Parliament. And it was in Coughton’s great gatehouse, early on 6 November 1605, that the family and associates of one of the chief gunpowder plotters received news of the plot’s failure. When we celebrate Bonfire Night now, it seems very far removed from the events of four hundred years ago! For centuries since then, English communities have come together to build a big bonfire and make an effigy of Guy Fawkes using old clothes stuffed with newspaper or straw to burn on the bonfire. Guy Fawkes's first name found its way into the English language, and by the 19th century the word "guy" was used to refer to a strangely dressed man. From there it was adopted into English to refer to any man, and is of course still commonly used today. Lypiatt Park, on the road to Stroud, was once the home of Sir John Throckmorton, who was related to the plotters Catesby, Tresham and Winter. Lypiatt Park house is connected with the Gunpowder Plot by a cryptic note addressed by Lord Mounteagle to Robert Catesby at Lypiatt and in the early 18th century a room in the house was known as the Plot Room from its supposed use by the conspirators. 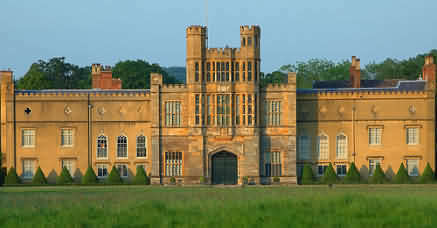 Hindlip Hall in Worcestershire, owned by the Habington family, was the hiding place for some of those involved in the Gunpowder Plot. Two of the Catholic priests who had been involved, Father Oldcorne and Father Garnett, sought refuge in the cunningly devised priest holes at Hindlip - which acted as a Catholic safehouse. John Popham (Lord Chief Justice) presided over the trial of the Jesuit, Robert Southwell, in 1595 and passed sentence of death by hanging, drawing and quartering. He also presided over the trials of Mary, Queen of Scots (1587), Sir Walter Raleigh (1603) and the conspirators of the Gunpowder Plot, including Guy Fawkes (1606). He sentenced Queen Mary and Guy Fawkes to death. While working as the messenger to the Queen, Popham was imprisoned by the Earl of Essex with his henchman. Ever stoic, Popham replied that at his age, death would be “but cutting off a few years.” However, he was rescued and rowed to safety by Sir Ferdinando Gorges (1565–1647). He was noted for his severity towards thieves and strict enforcement of the Penal Laws.